Audio Training Program: Say It! Hear It! - The Power of Effective Communications from Ready2Go Marketing Solutions, Inc.
Do you remember a time in the past when you had something important to say, an important message to get across, but you felt that it just didn’t make it? Or maybe there was a time when you wanted to start a conversation, but didn’t know what to say. Have you ever been in the position where you had to get out of your comfort zone and give feedback to someone and you weren’t sure how it was going to be received? Doing these successfully requires effective communication skills. And being able to communicate well is critical to gaining rapport with people, to understanding and being understood, and enhancing any relationship you have: parent-child, employer-employee, spouses and friends. Communicating well is a skill that can be learned, just like any other skill. The Power of Effective Communication 6 Part Audio Series. What to do to keep the conversation on track so your important message is heard. What is more crucial to sending your message than the words you choose? What is active listening and how can it make you an effective communicator? What is the most effective tool a good conversationalist has? The answer will shock you! How to start a conversation with anyone at anytime. What two kinds of questions will have information pouring out of the person you are talking to, and what kind of question will dam up the stream? How to make certain that everyone is completely understood. What is the sequence of questions to use that will get you the information you want? What is the sandwich technique and how can it help you change someone’s behavior? How you can be perceived as a charming and wonderful conversationalist while saying very little. How to lead someone into solving their own problems. Audio #2. Developing a Rapport by Active Listening. If you have rapport with your listener, your message is more apt to be heard. Audio #3. How to Start a Riveting Conversation and Keep It Alive! You don’t even know this person! What can you say to get things going? Audio #4. How to Ask and Get the Information You Want! All Questions Are Not Created Equal! The different kinds of questions to use to get the information you want and when to use them. Audio #5. Give Effective Feedback and Get Results! A positive technique to critique someone and leave them feeling good—and get results! Audio #6. 5 Steps to Solving Problems Productively. Great techniques so everyone feels heard and respected. 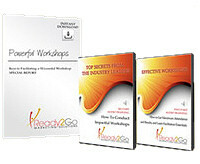 Audio Training programs are a powerful tool for delivering value and keeping in touch with your clients and prospects.